Lycopene has been widely known to lower prostate cancer risks and the typical method of making sure you get more lycopene is to eat more tomatoes as they are packed with the nutrient. 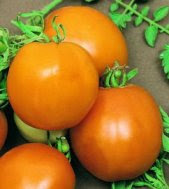 What is not widely known however is that not all tomatoes are made the same. ”Researchers reporting in the Journal of Agriculture and Food Chemistry tested the bioavailability of the prostate cancer fighter lycopene in tomato sauces and concluded that the tangerine tomato delivers two and a half times more lycopene than the normal red variety does. In fact, the authors found that circulating lycopene levels [in the blood] are 10 times higher after eating a sauce made with tangerine tomatoes than they are after eating a sauce made with roma tomatoes." The study was conducted by researchers from Ohio State University in 2007 and was republished in 2008. Also keep in mind that all lycopene is made more bio-available (meaning you can absorb it into your system better) when it is paired with fats such as olive oil. Make sure to always include your good fats in your diet and substitute tangerine tomatoes into your diet whenever you can to help decrease your risks of prostate cancer... and while you're at it you can always add broccoli to your tomato dishes for even more prostate cancer prevention. August is a just a couple days away from ending. It's hard to believe. Making it even more strange is that it's about the hottest day of the year here and my wife and I just bought our first Christmas gift of the season. Ohh my! Anyway, my lazy Saturday afternoon in my thankfully air conditioned living room is fast coming to an end. Here are a few things in the news that caught my eye this weekend. Top 5 Myths about Aging - "Growing old does not necessarily mean becoming senile, helpless, frail or a nuisance to others. It is entirely feasible to be a healthy, independent, happy and active senior who is full of vigor for life." Tech Advice For Living To 100 And Enjoying Life When You Get There - "Being 100 in this scenario overcomes some of the physical isolation that can result from physical frailty (and losing your nearby friends and family)." Doc, Got Anything To Make Me Immortal? - "We certainly don’t want to get ahead of ourselves... we will be in a position to use regenerative medicine in the widest sense to repair most things in due course, but this could take 20-30 years." Enjoy your Sunday and get some reading done... and try to stay cool while you're at it. 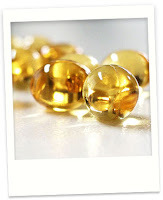 The consensus is in; fish oil benefits are clearly known by scientists, doctors, and nutritionists alike. Western diets consume a ratio of omega-6 to omega-3 that is too high for optimal health. According to Joseph Hibbeln, MD, who is well known and respected for his linking omega-3 intake to depression, 3,700 mg is the amount of the long-chain omega-3 fatty acids that American’s should consume per day to balance their current high intake of omega-6s. This number equates to approximately six high potency fish oil tablets per day or two servings of high omega-3 potency fish per day such as farmed Atlantic salmon, Atlantic herring or sardine. Obviously it’s go to be tough to put down two servings of fish per day and nobody likes popping handfuls of pills (despite the obvious fish oil benefits) so this number could probably come down quite a bit if we lowered our intake of omega-6 at the same time. Think of it as a replacement rather than a diet. Instead of eating beef every couple days which can contain high levels of omega-6, substitute your meat every other day with a serving of one of the aforementioned fish. Olive oils have better ratios of omega-3s to omega-6s than corn oils so make sure you always substitute corn oils out of your cooking. You can also look to other sources of omega-3s to include in or add to your routine diet such as flaxseed, omega-3 enriched eggs, walnuts, blue berries, spinach, and purslane (if you can find it). In fact purslane contains more omega-3 than any other vegetable though it is hard to find in American stores. No matter how you do it, through fish oil supplementation, diet, or a combination of them both you should really put an emphasis on doing something. Dr. Hibbeln and the American Heart Association are in agreement, though they differ on omega-3 requirement levels, that consuming more omega-3s benefits the heart and brain significantly. The AMA even stipulates that those with coronary heart disease should get at least 1,000 mg of omega-3 fatty acids every day. This of course should come as no surprise however to casual observers of dietary patterns of the long lived and the leading causes of death in America. Many of the longest lived populations of the world are coastal communities that eat more fish and free range animals that our western diet. Japan is the easiest comparison; they have far fewer heart related diseases than westerners and much of this can be contributed to their diet which is rich is fish and seafood with very little beef. Fish and omega-3 fatty acids regardless of source are instrumental to longevity and overall health. The fish oil benefits are clear so why don’t you make it a point to try to even your diet out just a bit? I talk a lot about health and nutrition on this site and how eating right can encourage long and healthy life-spans but today I’d like to touch on the topic of the best anti aging products, what they are, and why they are touted to work. These products are usually creams which are applied topically and if used regularly are said to make you look younger as you age. You might be asking yourself: Do anti-aging creams actually work? Well depending on the credibility of the product you can safely assume daily usage will likely delay the visual effects of aging in most people… the trick however is to find the best products and understand why they work compared to other options. Each of these product types work to battle the effects of aging which are primarily caused by two processes, the skins loss of collagen and the skins cell renewal process. As you age your skin cells begin to renew slower and slower. Between your 20th and 50th birthday the pace that your outer layer of skin replaces itself slows to almost one third of the speed that it used to take. At the same time the decrease in collagen in the skin causes your skin to lose it’s smooth definition allowing the wrinkles to begin to appear. Good nutrition and exercise can keep this aging process to a minimum but it has been shown that many of the nutrients required to support healthy looking skin do not make it to the skin cells in a great enough quantity to do much good. This is why topical creams are the typical means of anti-aging skin care. The direct application ensures saturated supplementation. What then do these creams do? They directly address the source of the aging process. Let’s look at each anti-aging cream for specifics of what they do. Idebenone – This product agent is simply an antioxidant that is used to prevent free radical damage. As opposed to other products which aide in repairing damage this product aims to prevent the damage from occurring in the first place. With less free radical damage it can be assumed that cell regeneration in the skin will be less necessary and thus the slowing of the regeneration process will be less important as we age. Idebenone is fairly expensive but if prevention is important enough for you these products can be found. Click through for a list of Amazon's Best Selling Idebenone Products. Hyaluronic Acid – This anti-aging product is essentially a moisturizer which masks the effects of collagen loss and wrinkle formation. This product is more often than not ideal for those who have collagen loss already and already show signs of wrinkles and aging. The proteins in this product penetrate the skin and then absorb moisture which is already present causing an effect where the skin inflates just enough to diminish or remove the visual wrinkles that have occurred with the loss of collagen in the skin due to aging. Think of this product as a topical form of Botox. It plumps your skin so that wrinkles are hidden. Like Idebenone however it is expensive. You’ll have to decide if hiding your age is worth the costs as this is simply no more than a cosmetic effect. Click through for a list of Amazon's Best Selling Hyaluronic Acid Products. Peptides – These products are touted as collagen boosters. The purpose of these products is not to mask the effects of aging but to actually attempt to stop or slow the aging process by boosting the body’s production of collagen. The skin, after all, only shows signs of wrinkles because of a loss of collagen. If the body can produce more collagen then the wrinkles could conceptually never appear. Of course a lot of advancement will have to occur for this to be the case but a little prevention never hurt anyone. Compared to Idebenone this prevention cream is far more affordable though still quite a bit more than an impulse buy in my opinion. Click through for a list of Amazon's Best Selling Peptides Products. Retinol – Retinol is a natural antioxidant found in vitamin A. Conceptually you could simply eat foods that contain a lot of vitamin A however a very small percentage of Retinol ever makes it to the skin cells. The Retinol that does protects against free-radical damage similar to Idebenone and also stimulates collagen similar to Peptides. Creams that are rich in Retinol are very inexpensive as Retinol is a natural substance and can be used effectively as a guard against the visual signs of aging. Click through for list of Amazon's Best Selling Retinol Products. Coenzyme Q10 – This product is another natural product that is applied directly to the skin for efficiency and potency. The product transfers energy to skin cells effectually treating the aging process of slowed cell regeneration. More active cells in the skin can refresh themselves quicker and can result is younger looking skin. Wrinkles can be softened with this product similar to Hyaluronic Acid but probably not as noticeably. The low cost however makes this product a worthwhile option as a treatment for aging that has already occurred. Click through for a list of Amazon's Best Selling Coenzyme Q10 Products. To conclude this post I’d like to point out the obvious. There are two basic forms of topical anti-aging skin treatments, those that treat signs of aging that have already occurred and those that seek to halt or slow signs of aging that have not yet occurred. Also the more natural the product the cheaper it is. I hope this short little guide helps in your decision on whether to use anti-aging skin care products and which ones but let me leave you with one last thought. Anti-aging skin care products, whatever their ideal purpose is, prevention or masking, are only cosmetic in nature. They will have no effect on your health or longevity in any way other than your attitude. If looking younger or better makes you feel better than the psychological effect might add some healthy years to your life as it has been shown that a good attitude and positive outlook on life helps with disease prevention and longevity. If you do not need to look young to feel good about yourself or have appositive outlook on life than maybe these products are only a luxury. The call is strictly personal in nature. I for one don’t use anything but if I were to I would use only preventative creams that were on the low end of the price range such as Retinol. Even Peptides are a bit out of my range but they could be a welcome addition to anyone’s prevention regimen. Did I miss any point about anti-aging products? Let me know in the comments. This is the third post in my series: Optimize Your Diet. This series focuses on identifying the foods we all eat regularly anyway and pairing them together to maximize their healthy attributes. 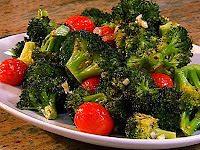 The first installment of this series discussed pairing your good fats with tomatoes and leafy greens, the second installment discussed pairing your good fats with foods that contain fat soluble vitamins: vitamin A, D, and E. This third installment will cover a very specific pair of foods that work together in simple harmony: Broccoli and Tomatoes. John W. Erdman, Jr., PhD of the University of Illinois recently published a study in the journal Cancer which proved that the food combination of broccoli and tomatoes helps prevent prostate cancer. Obviously we all eat both of these foods routinely so based on these findings there is clear reason to eat them together when ever possible. Prostate cancer prevention has never been easier. Unfortunately the conclusions of the study were unable to pinpoint why this combination of food worked in prostate cancer prevention, just that it did. The combination actually shrunk prostate tumors in rats more so than any other method of treatment outside of castration. The doctor went on to note that tomato powder has been shown effective at slowing the growth of tumors as does broccoli but it will take years do figure out why the two together are so effective at treating the prostate. How then can we utilize this to our advantage? Try mixing in diced tomatoes and olive oil to your steamed broccoli and garlic side dishes or add a bit of shredded broccoli to your tomato sauces. Frankly, just add a bit of the other ingredient whenever you pull one from the fridge. Both veggies are good for you so you might as well think of them as one unit whenever you cook. And for those already with diagnosed cancer, prostate treatment options in addition to medical treatment do exist. Nothing is fool proof but your effort is worth your time. The following is a guest post by Laurel Moll, HHC, author of Laurel On Health Food. 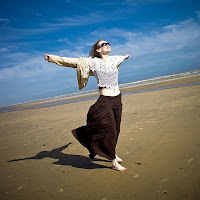 In addition to blogging Laurel is also a board certified holistic health counselor. You can visit her practice on the web at LaurelMoll.com. Dark leafy green vegetables are one of the most important foods to eat. But when you look at the typical American diet…they are sadly missing in action. Leafy greens are veggies such as spinach, turnip greens, kale, broccoli rabe, collards, arugula, dandelion greens, mustard greens, bok choy, cabbage, and Swiss chard. If you want to live a long, happy, healthy life…leafy green veggies are ESSENTIAL. If eating greens sounds scary or unappealing to you, it’s probably because you’re not used to seeing them on your plate or even at most restaurants! Try picking up different greens on your next trip to the grocery store or fresh market. My Easy Greens Recipe is a great place to start. Test it out, and I promise you’ll be craving greens in no time. If you enjoyed this post make sure to visit Laurel over at Laurel on Health Food or LaurelMoll.com. A recent study has shown that people with higher levels of Omega-3 fatty acids (EPA & DHA) running through their veins are usually happier, less impulsive, and generally more agreeable. The study conducted by the University of Pittsburgh found this very interesting association as they deduced yet another reason to include more fish and nuts in your diet. As you should know by now Omega-3 fatty acids are also associated with other positive effects on your body such as decreased risk of colon cancer, decreased risk of dementia & stroke, and general increases in longevity. You can lower your LDL Cholesterol levels by roughly 16 percent if you eat a diet that contains large amounts of plant sterols. These are natural chemicals found in vegetable oils and nuts and can even be found in fortified foods such as orange juice and some spreads. Just start your day every day with a bit of fortified orange juice and have a handful uf nuts in the afternoon and you’ll be doing pretty good so long as you stay away from the junk food that pushed your LDL levels too high in the first place. Check out this recent post on the blog for more comprehensive ways to lower your LDL cholesterol levels. The past week has been very busy. I have been fighting a cold most of the last week and took a few days for rest where I stayed at home and did nothing… except write of course. That I can comfortably do while curled up under a blanket with a tissue in hand fortunately. As always I wanted to take a minute and send a shout out to a few posts from others that caught my attention this week. Some of these writers I never would have come across without participating in the carnivals (which I have referenced below). If you’ve got some spare time click through and give these writers for a spin. I thought they were worth my time. Total Mind, Body, and Fitness Carnival with my article Life Expectancy and Mortality Rates: What's The Difference? Baby Boomers Blog Carnival with my article How Can I Lower My Chances of Stroke? Experiment: Gerbus presents Antioxidants: What Are They? – This article describes exactly antioxidants are. It’s academic yet readable and very relevant considering everybody under the sun knows that antioxidants are good for you but nobody really knows what they are or what they do. Campaign For Real Health presents a dissertation on How to Choose Real Foods – I say dissertation because man, this is comprehensive. Charles lays it all out on what real foods are and which foods aren’t. It’s a great educational read and based on the findings of Weston Price. The Senior Walking Fitness Blog presents Walking For Weight Loss and A Longer Life – This post resonates with the goals I have for my life and the values I have on this blog. Age should not be an excuse for a sedentary lifestyle and walking is a perfectly acceptable way to stay healthy and add years to your life. If you take a look at any of these writers let them know what you think. And thanks again to you, my reader. I hope I can keep churning out the quality content that keeps you coming back for more. Cancer of kidney is the 11th highest cause of death by cancer in America today. It is a disease that easily gets overlooked by the more common cancers but it is not a disease for you to brush off. Nearly 10,000 people die each year from this cancer alone. We should remain vigilant in attempting to lower our risks for this cancer just as we would for any other. Risks for all kinds of cancers can be linked to diet and kidney cancer is no different. Researchers recently reported in the International Journal of Cancer found that those who ate large amounts of refined-flour bread (i.e. 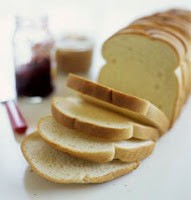 sandwich bread) doubled their risks for obtaining cancer of kidney when compared to those eating less refined flour. The researches classified the quantities of four to be equal to one sandwich a day versus two. The researchers further went on to speculate that the increased risk for cancer was due to the “blood sugar raising effects of refined carbohydrates”. These same blood-sugar raising effects are also what aggravate diabetes and can cause problems in insulin. Obviously you can diminish your risks by simply minimizing your intake of refined carbohydrates and white sandwich bread but you could probably do even better by only using whole-grain bread and increase the quantity of vegetables into your diet. This is a hub for the many human longevity tips and general information that this site has to offer. Average human longevity for developed nations is in the range of 75-85 years. This however takes into consideration all dumb habits that people take part in which decrease lifespans by causing problems such as cardiovascular diseases, cancers, and diabetes. Many of the stereotypical “old-age” problems can either be avoided or delayed, or their severity can be decreased by taking simple preventative measures and using proven anti-aging techniques. Frankly just limiting your vices are probably all that is needed to ensure you fall on the upper end of the range of human longevity. Among the obvious tips such as limiting bad habits, this page will list many articles and tips for longer living. It will be routinely updated and should offer you a great starting point for learning the basics of human longevity, disease prevention, healthy aging, and life extension. This page can always be found in the upper navigation bar of this site under the heading Longevity Tips. I would also like to mention the Best of Live a Longer Life page to it's left which is full of some of this site's best reads. I hope you find these pages helpful and I hope you start preserving your health and seeking increased longevity. How To Live A Longer Life is ever changing and the content is always expanding. I hope you enjoy these human lifespan articles and please do share them with your friends and family. Also, I invite you to obtain your free subscription to A Longer Life by clicking the subscription link below. You will be updated with new entries on health and disease prevetion news as they are published. Thanks! A while back I posted on some recent findings that showed that cell phones can increase your risk for brain tumors. What I didn't include in that article was a list of popular current phones that that will minimize your chances for developing these tumors based on the amount of radiation the phones emitted. I understand that basing your purchase on this level of precaution is bordering on extreme but I'm sure some will find it particularly useful. Caveat: This list is subject to change at any time and the stats provided are as published from other sources. I can not verify their accuracy beyond that nor can I perfectly keep this list current. Please do not rely on this information completely without doing your own due diligence as appropriate. Links in this list are affiliate links. Yet again, here is look on healthcare and it's inevitable reform, however this comical perspective is provided by none other than Jon Stewart and The Daily Show. The bit is quite funny and obviously pokes fun at the ultra-conservative movement calling Obama's healthcare proposal a death panel. Considering the fact that I find myself slightly conservative but siding with Obama on this one I feel I'm able to laugh with no strings attached to any side of this debate. The sketch however, I cast vote for Aasif's conclusions, "whatever scares the public most". Love it! Enjoy! In my last installment of my Optimize Your Diet series I introduced you to the idea of pairing your tomatoes and greens with good fats so that your body can fully absorb the carotenoids lycopene and lutein. This installment will show you that there are other foods that pair well with fats such as those which are rich in the fat-soluble vitamins A, D, and E.
First of all let’s identify some foods which are rich in these vitamins. Carrots, broccoli, and sweet potatoes are all very high in vitamin A. Vitamin D, aside from getting more sun, can be had by drinking milk, eating yogurt, or by eating fish. Salmon and herring have some of the highest concentrations of vitamin D. To get vitamin E from your diet you will find the highest concentrations in your oils and spices such as hazelnut oil, sunflower oil, grapeseed oil, sunflower seeds, almonds, paprika, and chili powder. 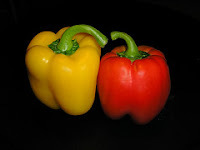 Vegetables containing vitamin E, in far less potency, include sweet red peppers, spinach, sweet potatoes, and broccoli. 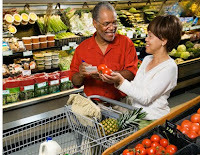 All of these vegetables you will notice are usually purchased at the store and cooked at home on a regular or semi-regular basis depending on the household but often the food synergies are not understood by the everyday home chef. All of these foods are good for you in many ways but the primary vitamins we’re looking at here are fat-soluble vitamins, which mean that these vitamins will not absorb into the body without piggybacking on fats such as olive oil, nuts, avocado, and dairy among others. Some synergies are quite easy to identify, for instance, milk contains vitamin D and fats and almonds contain vitamin D and fats. These are foods that are naturally conducive to absorption of the vitamins into your system. Others take some recognition and creativity. When sautéing your dinner in olive oil, splash some paprika or chili powder into the pan, for some added spice and vitamin E. You can drop some nuts into your yogurt in the morning to optimize your diet, or add avocado slices to your spinach salads and dishes. You can even mix in some grapeseed oil into your cooking regimen (it will make you feel full too) by using it as the base oil for your spinach salad dressings or for sautéing your sweet peppers. When my wife and I steam broccoli (vitamin A) we like to coat it in a pinch of melted butter and plenty of sauted garlic. The possibilities are endless if you just get creating and learn what foods contain which vitamins. The point however is that these are foods that we all eat all the time. If we’re not going out of our way to eat something different we should easily be able to at least eat these foods in harmony with each other so that we can realize their full potential for our own health. If you have any doubt as to what your food contains or if you wish to learn what foods contain which nutrients I highly recommend spending some time over at NutritionData.com. Their food database is amazing. Just come back for more here at How To Live A Longer Life; I’ve got lots of things planned for the future including additional posts in this series: Optimize Your Diet. Thanks for reading. 10 Ways To Help Chill Stress Quickly - "Stress is like having ticking time bomb inside of you... so consider getting it out." A nice list from The Centenarian to remember when we get too worked up with life. Not Sure I Want to Join the 'Super Old' - "Centenarians are usually more practical than idealistic, something that makes a huge amount of sense to me. Hoping for the best isn't nearly as health-promoting as learning to live with what you're dealt." Centenarians: Living to Be 100 Years Young! - "If you rest, you rust." Words of wisdom that I deeply believe. Accidents are among the most life threatening situations people face on a daily basis. Whether you are young, middle aged or old accident cannot be avoided. Here are just some of the many causes of accidents and what you can do about them. Accidents at work are most experienced by the working class middle aged person. They typically tend to be in blue collar jobs where the work accident involves physical labor and large machinery. Work accidents are usually the fault of the employer unless the employee was acting outside of normal working duties. If you want to avoid accidents at work you should consider job options that involve safer work environments. This is obviously not possible in all cases and is completely up to you and your threshold for risk. Work accidents cannot be avoided but they can be minimized if you feel like sacrificing. In addition to workplace accidents auto accidents are the most obvious cause of injury and death of them all. They are also quite easy to visualize and understand as many people have been in an accident at some time or another. Not all traffic accidents are your fault and not ll are serious. Some traffic accidents are even the responsibility of your employer if the accident is caused during working hours while on working responsibilities. Obviously it is not possible to avoid driving but you can minimize your risks for getting into bad accidents by simply driving carefully, defensively, and slowly. Wear your seat belt, don't use your phone, and don't drink and drive. Other accidents other than workplace accidents that are less thought of but quite serious are those that the elderly face on a regular basis. Falls. Falls can be a common workplace accident in certain situations and though accidents at work involving falls are usually more dramatic, falls at home are the leading cause of accidental death. Statistics show that roughly one third of all elderly people have a bad accident by simply falling. Obviously this can't be avoided but it can be minimized if we all just exercise more and stay agile as we age. So let this be my lesson to you. Be careful while driving; choose a job where an accident at work is less likely, and stay fit while you're young. These are the best ways to avoid the worst bad accident. Good luck. ...and while you're at it enjoy this last reason bad accidents occur. This aint no workplace accident! This past weekend I finished up The Blue Zones by Dan Buettner. I was first introduced to this book by a commenter, Chris Kaiser, on this very blog back in June. After a little Googling I found this to be one of the most current books on longevity on the market today. Buettner, writing for National Geographic, authored a cover story in 2005 titled Secrets of Living Longer. 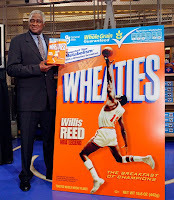 It was a well regarded article and a finalist for the National Magazine Award. Expanding on this article, Buettner authored The Blue Zones which identified four specific areas of the world where the population lives noticeably longer, healthier lives. The areas identified are micro-populations, small areas of larger geographic regions. They include Loma Linda, CA, Okinawa, Japan, Sardinia, Italy, and Nicoya, Costa Rica. Because these areas are so case specific and standouts when compared even to their greater geographic regions: California, Japan, Italy, and Costa Rica, Buettner and his team traveled to the regions with demographers, translators, and historians to identify what factors make these smaller populations different and why they so naturally seem to live longer healthier lives. The Blue Zones is more of a story than a how-to guide. It is more of a dialogue between persons rather than the monologue of a specialist. Buettner packs this book with mostly stories from centenarians that he and his colleagues met in their travels. In each location they found an extraordinarily high percentage of the population over the age of 100 and found as many of these centenarians to interview as possible. Many of his interviews did not even seem to be interviews at all as Buettner simply sat in the presence of village elders and simply watched them, their families, and friends interact with one another. Many of the stories were quite fascinating. Through the course of Buettner’s travels he and his team begin formulating observations which point to causes of longevity and these summarizations are found in The Blue Zones at the end of each section. As you read you will slowly notice parallels between the four zones despite their seemingly very different origins. Most notably is the fact that all four zones share an overwhelming sense of spirituality though not in the same religion. In each region the elders feel they have a deep purpose in life specifically as an elder. They still provide and they care for others. Each of the four regions share a strong sense of familial closeness. Elders are deeply connected to the family and live with the younger generations. Love and support flow upward and downward through the generations of family members in a way that is not always the case in other parts of the world and especially in America. Each group seems to have experienced a diet mostly vegetarian over a lifespan though not completely. They all eat low calories and three of the four lived generally in poverty forcing their reduction in calorie consumption. All four regions value, enjoy, and participate in hard (often physical) labor for most of their lives, even into old age. Lastly, each group of people generally had access to a level of healthcare capable enough to take care of basic needs, diseases, and infections. Generally diet and activity levels were associated with the avoidance of more modern ailments and longevity associated diseases. As I read this book I first noticed how surprised I was to find so much story telling versus scientific ramblings. At first I was even discouraged because I was looking for these “secrets” from the elders to be backed up by science but after a while I began to enjoy the book for what it was, a story of long lived peoples and how they came to their place in life. A lot of the book speaks in generalities and a lot of the longevity is due to simple luck of the draw as none of these people likely practice perfect laboratory anti-aging practices but that’s the point. This is the story about how normal people live extraordinary lives and enjoy them into their 11th decade of life. They all are happy and they all find life to be a joy. The stories make you sit back and think about your own life and identify the mentality you bring towards life, what you find to be joyful, and what you find to be purposeful. If you read this book, which I recommend as it is a joy to read and not too long to lose your attention, I recommend diving in with the understanding that this is not a how-to book, it is a story of amazing people that happened to grow up in the perfect setting for longevity and happiness. Enjoy. This review of The Blue Zones by Dan Buettner is part of my book review series on the most popular longevity books on bookshelves today. Click through for the whole list of books on longevity or take a look at my review of Longevity Made Simple, my most review on a book based more on clinical research rather than word of mouth and observation. I came across an interesting study today that was published in the European Heart Journal that found that tea drinkers who mix milk into their tea do not realize the full health benefits as those who do not. The study was conducted because researchers noted that though tea is generally associated with increased cardiovascular health it does not seem to be the case in England where tea is often mixed with milk. Researchers from Charite Hospital, Universitatsmedizin-Berlin, led by Dr. Verena Stangl had subjects drink freshly brewed black tea, black tea with skim milk, and plain hot water. Ultrasounds then showed that those who drank black tea without milk experienced increased flexibility in their arteries. Those who drank milk with their tea or pain water experienced no benefit. "Black tea significantly improves the ability of the arteries to relax and expand. But when we added milk, we found the biological effect of tea was completely abolished... 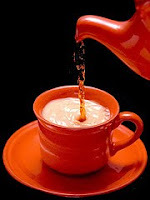 If you want to drink tea for its health effects, don't drink it with milk." Conceptually this is interesting but I naturally wonder if there is more to it. I previously wrote that saturated fats having an immediate effect on the blood in that the fats cause an immediate inelastic effect on the blood vessels. This finding could conceptually offset the positive elasticity effect of black tea however the above study used skim milk which has very little saturated fat content: .3g per cup as opposed to 5 g per cup of whole milk. Obviously this is probably not a candidate and the researchers are probably right in that it's not the milk fats offsetting the benefits of black tea but the milk proteins. Regardless on what you think of this finding there are unquestionable benefits of drinking black tea. If you're going to do so you might as well learn to like it straight up; it's better for you. Scientists led by Dr Henrik Poulsen from Copenhagen University Hospital discovered that consuming olive oil reduces the oxidative damage (damage caused by free radicals) to DNA that can lead to cancer, according to their report published by the Federation American Societies for Experimental Biology. I’ve previously written that finishing high-fat meals with olive oil or walnuts can help with arterial elasticity; well these findings show that not only can the olive oil help with arterial health but it might also help lower your risk for developing various cancers. Maybe that after dinner drink (olive oil) isn’t so bad after all… though it still seems gross to me. Of course I also wrote a while back on the positive effects of the Mediterranean Diet. The diet is associated with a 6 percent reduced incident and mortality rate from cancer. This might be simply because of the use of olive oil in the dishes. Of course some weight must come from the diet's focus on veggies but nonetheless the cited findings do support this diet. Maybe you can couple the use of olive oil in your cooking with the after dinner walnut snack for a double dose of cancer prevention tactics. What’s you opinion? Do you think olive oil shooters are worth it? CNBC's Erin Burnett just aired a segment on Street Signs today that illustrated exactly what I was getting at in my post last night on the healthcare costs of the obese. In the segment her guest is Dr. Delos Cosgrove, the President and CEO of the Cleveland Clinic. If you haven't read the post my basic premise was that obesity is a major factor that adds billions of dollars of burden on our nations healthcare and insurance system. I argue that incentives need to be put in place to get people to live healthier lives and disincentives must be put in place to push people in to not living destructive lives. The costs must be spread so that healthy people do not subsidize the poor lifestyle choices of the obese. And for reference purposes obesity is officially described as being a BMI of 30 or greater... give or take depending on body type. The segment on street signs deals with these very issues and is well worth four and a half minutes of your time. A new conclusion has recently been found by the Framingham Heart Study (a 60-plus year study of more than 5,000 adults in Massachusetts) that should warn patients of increased risks for stroke. If you suffer from depression, you should give more consideration having your heart checked. Depression is opposite to having a positive outlook on life so this should not be surprising considering people who are genuinely positive have a lower mortality rate from all causes and time frames and they are more likely to recover from ailments. Stroke is the third leading cause of death in America and is closely associated with heart disease and atherosclerosis thus depression should be taken very seriously. You can follow your doctor’s orders to fight it but you can supercharge the results by taking up an active lifestyle as exercise has been shown to be just as effective at treating depression as medicine is, plus the exercise will help your cardiovascular system at the same time decreasing the odds for stroke or heart attack. Good luck and remember: Stay positive! My wife was reading the most recent issue of Time Magazine (Aug. 10) the other day and she showed me a blurb in the issue that broke down the costs of health care broken down not by age or disease but by the patients level of obesity. I found it fascinating and equally maddening. Time sourced the following facts from a report that was recently published in the Journal Health Affairs. What strikes me is nobody seems to care about these numbers. We all kind of shrug them off; maybe we gripe modestly, but then we move on with life. Politicians debate how to fix the system; they try to figure out why we spend so much on healthcare and how we could spend less. They don’t however take the problem head on. Until we start spending less on marginal life extension and start focusing on the obesity epidemic in America healthcare costs will continue to rise. You want to know how to live a longer life? Stop prolonging the life of the unhealthy with expesive treatments and start encorgaing and teaching people to stay healthy in the first place. $147 billion dollars of spending are directly due to obesity, of our economy that represents 1 percent of the entire GDP for the nation. Currently as our nation is in recession that means GDP is falling and yet healthcare costs continue to rise. Even in the best of times GDP is only increasing at a rate of 2-3 percent. That means at these best of times rates that in 11 years obesity related healthcare spending will equal 2 percent of GDP, and in 18 years it will be 3 percent. At some point something has to change. In my humble opinion we need to make drastic incentives for people to live healthier lives and conversely discourage obesity through progressively difficult to swallow measures. The simple fact that my health insurance costs the same for me as it does for my smoking, overweight coworker is insane. Drivers pay less if they're deemed to be in a safer demographic, it should be no different for healthy people and health insurance. I feel it is wrong for healthy people and the American taxpayer to subsidize the unhealthy and lazy lifestyles that so many people follow. I’m not saying all obese people are unhealthy. I know there are exceptions to the norms. Some obese people have natural disadvantages such as genetics but most do not and many are simply not interested in changing lifestyles. They mooch the system and run up the cost for everybody. It should be their choice to live how they want but we should not have to pay for it; they should. UPDATE 8/13/09: You might also be interested in viewing this video, The Skinny on Obesity, which aired on CNBC 8/10/09. The following is a guest post by Lauren, author of the lifestyle blog Holiday Honey. In this post: Argument For The Vegan Diet, Holiday provides a different perspective on diet than I have previously provided on this site. There are strong ethical and dietary implications for a lifestyle of veganism, so the decision to live such a lifestyle should be up to you to decide for yourself. As far as dairy goes, most people (even well intending vegetarians) assume that there is no cruelty in the dairy industry. People have even gone so far as to say that cows need to be milked for their own health, comfort, and proliferation of species. Cows are housed in corporately owned factories by the hundreds. They are treated like milk machines, and the fact that milk is actually produced for their calves is completely overlooked. The cows are genetically enhanced to produce an unhealthy amount of milk for human consumption - up to 100 lbs per day. This is ten times more then they'd naturally produce following the birth of a calf. The genetic alterations and hormones given to cows cause their udders to swell in size and hang lower then what's comfortable. They drag on the ground, which causes infection. Infection leads to antibiotics (leading to human antibiotic resistance). Cows make milk solely to feed their babies, NOT to feed humans. Cows are forced to give milk even during their pregnancies. Cows typically would live up to 30 years in nature, but thanks to the corporate dairy farmers out there, they rarely live past age 4. Additionally, we are the only species on earth that drinks the milk of another species. It's weird, cruel, disgusting, and will make you sick over time. In fact, dairy consumption is related to heart disease, cancer, acne, halitosis, joint pain, depression, and a slew of other avoidable ailments. According to Harvey Diamond, of Fit for Life ; "Dairy causes disease." Furthermore, the veal industry is a direct result of the cruelty of the dairy industry. Therefore, if you drink milk you support veal consumption. Keep in mind that cows have to bear calves in order to produce milk for human collection. These cows have a baby every year -- a completely unnatural incidence. Could you imagine being impregnated every year of your life against your will? These babies are either used for more dairy (if they're female), or they sent to veal or beef farms (if their male). Male calves used for beef and veal are ripped from their mothers upon birth. Calves are kept in crates, only about 2-3 feet wide. 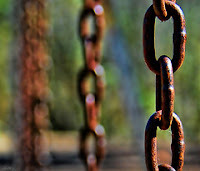 They are chained by their necks and limbs to stop them from moving at all, preventing them from burning calories (i.e. to keep them fat). This makes meat more tender (which is why people like veal) since they have little muscle tone. Calves' limbs' often become so weak that they can no longer sustain their bodies. After about 3-4 months of force feeding and inhumane conditions, calves are slaughtered to make veal. These calves are literally driven crazy and medicated. These medications wreak total havoc on the human body, and are largely to blame for the vast array of human diseases today. According to The China Study, it is animal protein specifically, and not chemicals, that is the most correlated substance to cancer in the world. More people shun the vegan theory than support it. Ultimately, I don't really care when people criticize my vegetarian diet, although it is frustrating when people say "just eat it, it wont kill you," because in fact, it may. I don't care for unsolicited opinions. The real goal should be to have a greater consciousness of what goes into your mouth. Certainly, its hard to make all of these changes at once, so try slowly. It's much easier to give them up one thing at a time. Plus, if you wake up after a few days of veganism, once the initial detox wares off, you'll feel absolutely fantastic! Ditching animal products raises your karma. After all, you're not ingesting death and slaughter. Furthermore, lessening animal product consumption with most certainly extend the length of your life, while simultaneously elevating its quality. Best of luck. We'd love to hear your opinions on veganism! Please voice yourself in the comments section below... and if you enjoyed this post make sure to visit Lauren and her readers over at Holiday Honey. Over the past week I've tried to stay busy with the usual but I found myself putting a lot of extra time into doing things around the house. Sometimes chores have a way of sneaking up on you. Obviously I've maintained a light posting schedule here for the past few days but that doesn't mean I haven't read some great reads from around the web. As my regular readers know I like to try and spread the love around with who's got interesting things to say so I thought I'd send a few shout outs this week to fellow bloggers and link out to a few stories that I felt were particularly compelling this week. First of all I was included in a few carnivals this past week including the Take Charge of Your Healthcare carnival, the Carnival of Inspiration and Motivation, the Carnival of Financial Planning, and the Total Mind and Body Fitness Carnival. My posts included the High Costs of Healthcare, Think Positive and Fight Depression, and 11 Ways To Reduce Insulin Resistance. If you haven't read them yet I hope you will do so. These carnivals, however were chalk full of many great reads and I think you would be doing yourself a favor by wading into them and window shopping for articles that peak your interest. Shockingly Dangerous Killers in Your Everyday Life - This article is essentially an essay on the dangers of electromagnetic radiation which accompany the use of virtually all forms of electronics. I know we can't really stop using modern technologies but we can be conscious to the what we're doing and how we might minimize our exposure. I wrote an article a while back on cell phones and tumors; I might have to do a follow up. 50 Foods Under 100 Calories - I had a request a while back for meals that were light in calories so I posted this low calorie meal idea. This post however provides a basic list of foods which are low in calories. You can mix these into mini-meals or just keep as reference when snacking. The Air We Breathe - by Healthbolt - This makes me think that the HEPA filter I bought for our living room a couple months back was a great idea. Aside form the carnivals and my regular subscription reads, there has also been a lot of interesting news stories that I found stumbled across. I thought I'd share some of these with you as well. Sperm Shows Longevity - A major 40-year Danish survey published in the American Journal of Epidemiology concluded that “Men who have good sperm quality have a greater chance of surviving than other men.” Interesting. Kuzyk Attributes Longevity to Hard Work - "Mary Kuzyk of Wasaga Beach, who celebrates her birthday with family Aug. 8, actually turned 100 years old on April 23." She attributes her longevity to hard work which correlates very closely to many of the findings that I'm reading in The Blue Zone. Hard work and purpose is associated closely with longevity. A Nutrient in Breast Milk Boosts Immune Health and Longevity - "It’s a fact that babies who are breast fed tend to be healthier than babies who are not. That’s because breast-feeding mothers pass a nutrient onto their babies through their breast milk—colostrum." Interesting read, I think I'll have to do more research to develop my opinion though. Thanks for reading everybody. Have a great weekend!